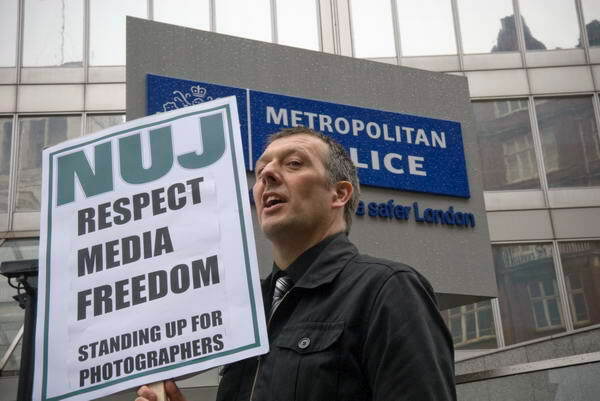 Along with 20 other photographers (dozens according to the NUJ site, but I made it exactly 1.67 dozens) I went along to New Scotland Yard this afternoon to photograph the one person protest by Jeremy Dear, NUJ General Secretary, to highlight the failure of law enforcement officers to protect media freedom. 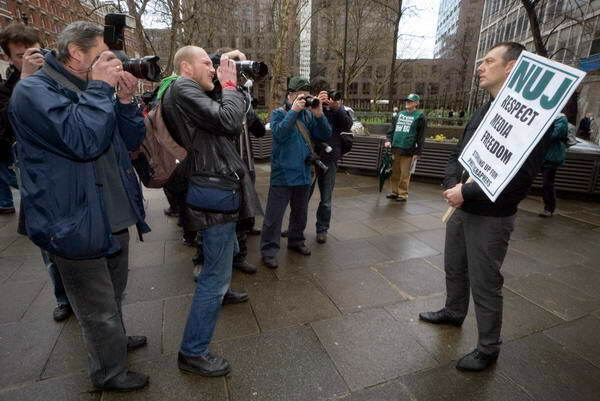 If you are a regular reader of My London Diary and this blog you will know I often have reason to complain about the way some police officers impede the work of photographers covering protests on the streets. Sometimes its a matter of individual officers deciding that we shouldn’t be photographing particular events – as in the case of the officer who stood in my way while a young man was being stopped and searched in Whitehall, and when I attempted to move into a position that gave me a clear view while in no way interfering with the work of the police ordered me back. At other times its a failure by the officer in charge to realise that we need reasonably close access to events to photograph them adequately. Sometimes we are even denied access on spurious grounds of road safety – when police officers are standing further out in the road than photographers would. There are agreed guidelines, but too often police simply ignore them. 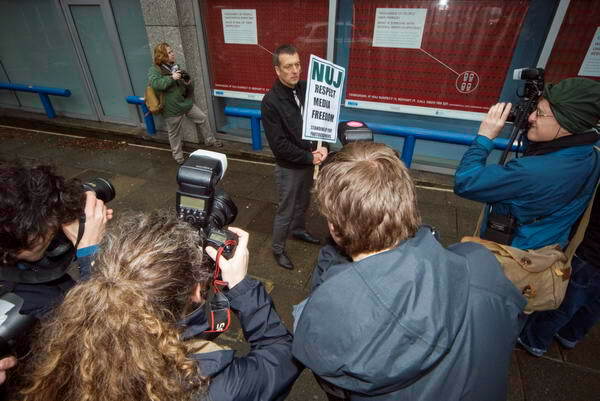 At times officers have even denied that my NUJ Press Card is a valid press card, and have treated me as a protester rather than a reporter, refusing for example to allow me to leave a protest when I have finished taking pictures. In particular the SOCPA legislation which has made many demonstrations around Parliament illegal has soured relations between police and press – as well as those between police and protesters. So its good news to hear that the relevant aspects of this law are to be reviewed, although we may fear that a SOCPA Mark 2 will be no less inimical to the rights of citizens to protest. SOCPA provided a limited right for one person demonstrations, which although they had to give notice, the police are not entitled to ban, although they can impose restrictions. So Jeremy had duly applied, filled in the forms and answered various questions about his demonstration (the police were apparently very exercised about the actual wording of his placard) and been granted permission, and photographer Marc Vallée had talked, texted, e-mailed and contacted through Facebook and other on-line sites with photographers to persuade them to come and photograph the event at New Scotland Yard, bribing us with the offer of a free drink to celebrate the out of court settlement his lawyers recently agreed with the Met for his injury during the ‘Sack Parliament’ demo in October 2006. It was a fairly daunting group of photographers to be working with, including a few well-known names and as always we all wanted to take a better picture than the pack. 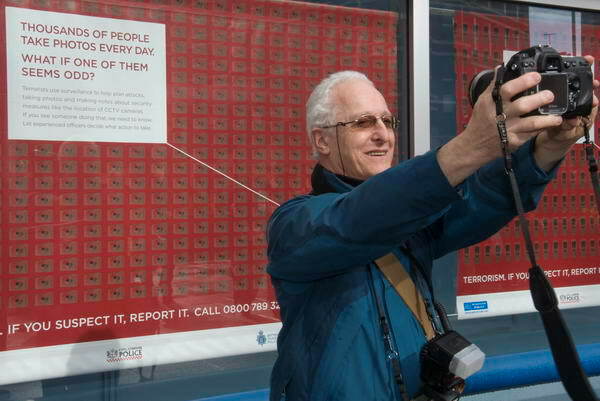 There wasn’t really a lot to work with – just Jeremy with a placard, New Scotland Yard as a background, and of course the other photographers, so it was something of a challenge. 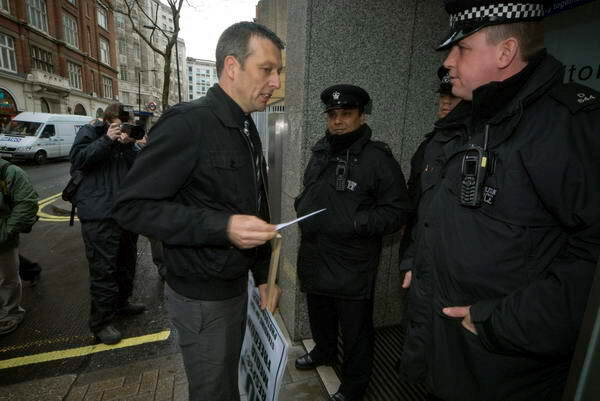 I started with a straightforward picture of Jeremy with the placard and the New Scotland Yard (or Met Police) sign behind him. Not a bad snap, but nothing special. But obviously it would be more interesting to have both him and the photographers. I tried a ‘Hail Mary‘ from behind with the 18(27)mm wide-angle end of the 18-200; perhaps a bit too prosaic, and of course you can’t see his face, nor the whole of the placard. Unfortunately for once the police were simply ignoring us and standing some distance away. I tried a few shots including them, but the placard was just too small, so I came back to photograph the pack from close in using an extreme wide-angle. Several rather similar shots to choose of which I thing this is the best. and coming down lower perhaps provides a more interesting shot. Moving in close to Jeremy, still working with a very wide lens I could show him, the poster (though a rather oblique view) and the line of cameras pointing at him. 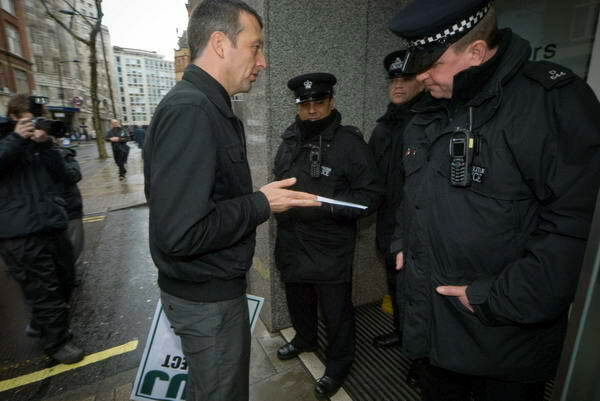 Jeremy then moved to hand in a letter to New Scotland Yard, but they refused to take it. I moved fast to be in the right place and shot from close with the 12-24mm, getting a couple of shots that aren’t bad. 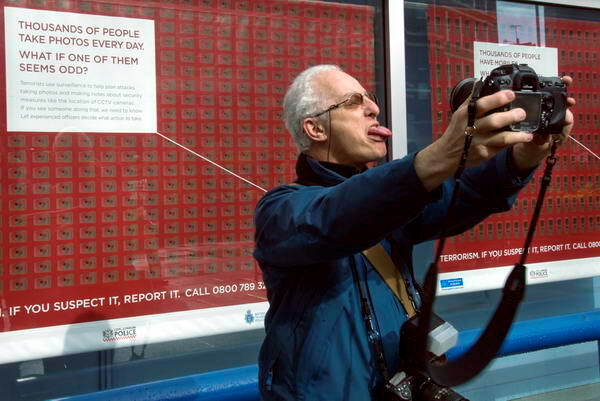 ‘THOUSANDS OF PEOPLE TAKE PHOTOS EVERY DAY. WHAT IF ONE OF THEM SEEMS ODD? 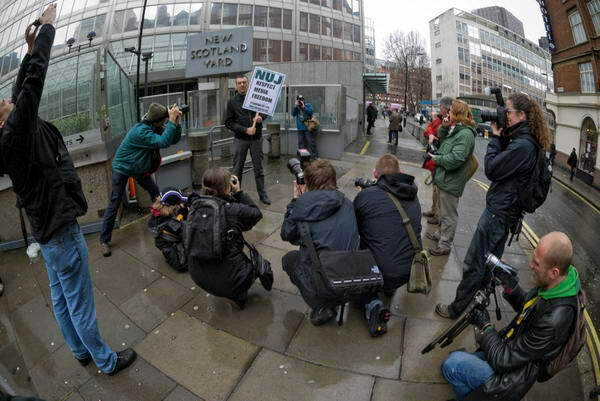 Again my starting point was a simple image of Jeremy with placard in front of this. Then I shot the pack facing him, but couldn’t include the poster in this. Shooting over their heads provides an image including the poster, but not I think a very strong one. Finally came a few pictures of photographers standing in front of the poster and looking odd. If I post these here they might never speak to me again, so I’ll tuck them away in case I ever need them for blackmail. This entry was posted on Friday, March 28th, 2008 at 10:53 pm and is filed under My Own Work, Photo Issues, Reviews etc. You can follow any responses to this entry through the RSS 2.0 feed. You can leave a response, or trackback from your own site. This is a strange and worrying campaign by the Met. Is it really intended to foster distrust and fear? The implication is that only the police have the knowledge to decide whether someone’s behaviour is innocent, as a population we should assume the worst. For myself this is the worst kind of fascist propaganda. I know the argument is that there is an obvious difference between a journalist, an artist or a tourist taking a photograph and a terrorist doing research but in my experience I have found that this distinction is actually rarely applied. I have often been questioned by the police. I bite my tongue but I feel like asking them ‘when was the last time you saw a terrorist making long exposures using a 5×4 on a tripod in daylight in full view?’ and how do you distinguish a terrorist from a tourist when on Westminster bride at any given time there are dozens of people photographing the Houses of Parliment? This is an absurd campaign and indicative of the Police State attitude we have to put up with.